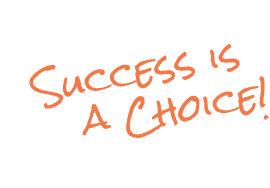 Success is a process of self-improvement that leads to forward movement in the direction of one’s dreams and goals. Speakers in our Quarterbacks of Life® roster are everyday people who triumphed over incredible obstacles to achieve their dreams. Some of our Quarterbacks of Life® are actual former NFL players, but most are not. All of them, though, never gave up when they faced great challenges. They beat the odds. By adopting a similar never-give-up attitude, we believe all people can persevere and realize their dreams. The story of one man’s life from another generation partnered with hundreds of other stories can help students see what the human spirit can overcome and accomplish in one’s journey. This powerful step-by-step process teaches students how to apply the lessons they learn in the assemblies so they can live meaningful, purposeful lives as caring human beings and builders of caring communities. The QBOL™ Program teaches us more life lessons and helps us get involved with helping our school and community. The Quarterbacks of Life® Student Success & Leadership Program is designed to be accessible by students, parents, teachers, and guidance counselors. It can integrate easily into a school’s academic curriculum to help promote student success in school, career, and life. The backbone of our curriculum, The Five Stepping Stones to Success, breaks down self-improvement into simple actions that can be taken to propel students in the direction of their goals. Throughout the school year, teachers can implement the curriculum to teach their students the life skills needed to realize dreams and have a better shot at living meaningful, safe, and productive lives. 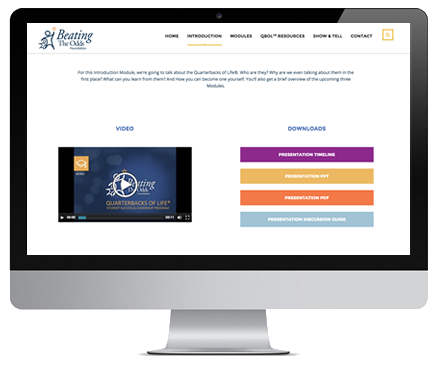 Quarterbacks of Life® Student Success and Leadership Program’s curriculum is authored by Dr. John C. Worzbyt, who has been developing curriculums with the Beating the Odds Foundation for schools since the foundation’s beginning. In reviewing and analyzing the units [the QBOL™ curriculum modules], we found that they address and align with the Student Interpersonal Skills (SIS) in the Standards (School Wide Area of Focus) element of SAS. The units address SIS1 self-awareness and self-management skills; SIS2 interpersonal skills and maintaining positive relationships and respect for diversity; and SIS3 decision-making and responsible behavior in many contexts. I also informed our CCC group that the activities in the units additionally fit and align in the Safe & Supportive Schools element of SAS. The activities presented in the units align and address engagement, safety, and environment (academic, wellness, and discipline) as defined in the SAS element. Many of the units’ concepts/skills coverage and activities add valuable resources and materials teachers would welcome to extend the SAS Framework. The Beating the Odds message has reached more than 500,000 students to help them develop a life-long desire to succeed. We’ve received a wealth of real feedback from real students who are really benefiting from our inspirational assembly program. Since 2010, our curriculum has also been integrated into more than 2,000 U.S. Army JROTC programs. Your program was entertaining and educating. Thank you for persuading me to believe in myself. I promise I’ll reach my goals. 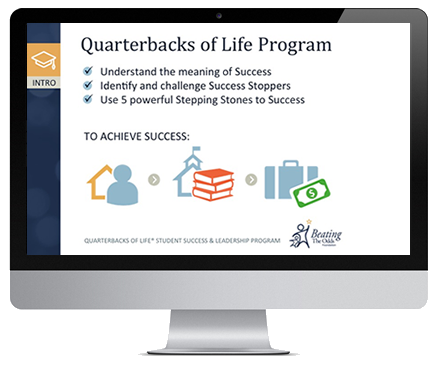 The Quarterbacks of Life® Student Success & Leadership Program curriculum is a tool to help educators empower and encourage their students to succeed. Once a school has access to the online material, teachers can login and begin working through the program at their own pace. There is no required timeline to finish all the modules. Being able to help Kaley and Ben was so awesome! I am happy that they included the entire class. I think it showed great teamwork and our ability to make school fun. I learned a lot about Rocky in class as Ben and Kaley were researching his life. It was surreal to actually see him in person after knowing about his life experiences. Dear Mr. Taliaferro, Thank you very much for coming to our school and sharing your truly amazing story with us. It inspired me very much. It helped me realize that you should follow your dreams, and no matter what you should never give up. The most memorable part of your presentation was when we got to see how you were injured, how you survived, and how you pushed through this obstacle. Your example could help me in my life, and it can remind me to be grateful for what I have and for what I could do because my life could be a lot worse. Thank you again! I salute Rocco Scalzi, Rocky Bleier, Bob Wieland and the many other individuals who have beaten the odds and are now playing an indispensable role in the fight to combat drug abuse and its consequences. Your many contributions are recognized and deeply appreciated. Beating the Odds is a message worthy for us to long remember. Today, as I walked through Hillview, I heard numerous discussions of excited students talking about yesterday. Several parents also expressed their appreciation for the experience their child had. It is very evident that this nation faces a critical juncture, and if we do not rescue at-risk youth from the threshold of academic and social failure, we risk an uncertain future. More than merely gathering statistical data, Beating the Odds mentors are on the front lines, providing positive guidance to students and their families. This individual and community building program emphasizes the development of the whole person, and enables troubled youth to transcend their past difficulties.